It's Hip 2 Serve! 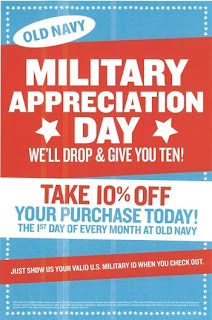 : Reminder: Old Navy 10 % off tomorrow! In case you are need of school clothes for the kiddos or have been meaning to head over to Old Navy, be sure to mark your calendars for tomorrow, September 1st! This discount is valid for all eligible active, retired, and reserve US Military personnel and family members who present a valid Military ID. Happy Shopping!